This is a great evocation of life in suburban Ireland in the 1990s, through the eyes of a precocious child who will see some great changes in the country. Is it good to go? Synopsis: Story spanning 40 years of a life affected by Ireland’s changing relationship with divorce, abortion and LGBT rights, set in dual location between Dublin and Cork. Eimear is a precocious altar-server at Mass. Years later, she has moved away from the church, theatre becoming the important community in her life. I was in the hallway to the sacristy, waiting for Father Fitzgerald to come out before mass started, hitching my white robes up to stop them from getting wrecked under my shoes. The voices of the congregation made an indistinguishable hum outside, a assortment of gossip about neighbours, teachers and shopkeepers. It was dark in the hallway, with just a sliver of light spilling in from the church. When the door to the sacristy opened, Father Fitzgerald stepped out, and behind him, holding up the hem of his cassock like a grotesque wedding dress, was Robbie Casey, a shining trail of snot running from one of his nostrils down to his upper lip. I stood in my place beside Robbie and took the candle in its brass holder from the Father, and we followed him outside. The light was bright on the altar and I squinted against it, adjusting from the dark in the hallway. It seeped into the chancel in red and blue and green, shining through Jesus’ glassy robes in the window. The organist Mrs Rooney started up, and there were all the people singing away as if they hadn’t just been gossiping enthusiastically minutes earlier. Mrs Rooney nodded at us dramatically as she played, with her shaggy, old eyebrows raised as if to say “I’m keeping an eye on you two, now.” Robbie was staring at the pale tabernacle with the look of an insufferable saint on his pasty face. The mass itself was a grand old show. Between the music, the candles and the incense, you could as well have been at a play. Bells chimed to let you know the holy spirit was coming down and the wafer and wine were turning into Jesus’ body and blood – it was supposed to be magic, but it was really just me or Robbie ringing the bell. There was even a bit where the audience shook hands with each other – “Peace be with you”, they’d say. “Pleased to meet you”, my sisters whispered in the front row and fell about giggling like a pair of little piglets. That was their private joke – when I was too little to know any better, I thought that was what you were supposed to say. My sisters sat there in the front row every Sunday at ten, their friends on either side of them, all competing to have the most lacey bits and flowers on their frocks. That was what they did for fun: went to mass with their friends. The church was only down the end of the estate, and we were allowed walk there on our own, past the grey houses with their alternately pampered or weedy front gardens, past the green on the right where we played picnics in summer, and past the shops where we weren’t allowed go without a grownup because of the older boys hanging around there. My sisters always came back to mass again at twelve with Mammy and Daddy. Mammy would have killed them if she knew they took communion both times. 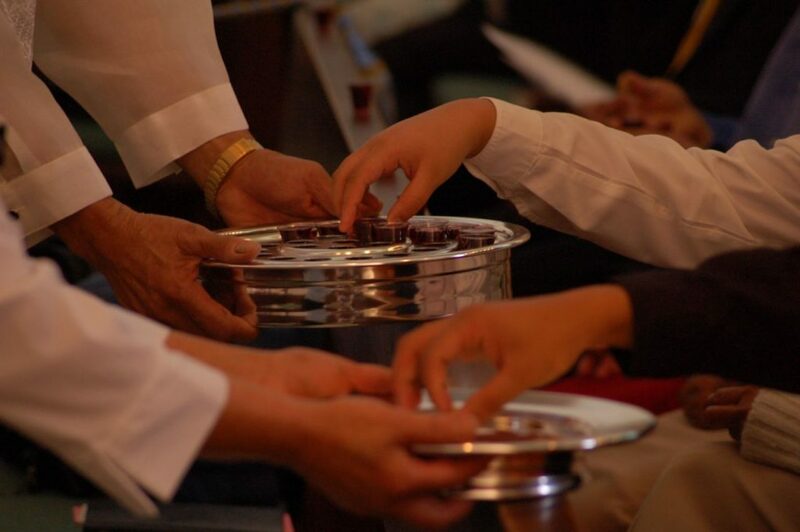 Robbie and I always got communion last, after everyone else was back in their seats with their heads pointed down, thanking God for gracing them with his presence. I held my hands out in a little cup like we were shown in school. Robbie just knelt there with his tongue sticking out, too pious to touch Jesus’ body. “Eating Baby Jesus”, I whispered to him with a grin as soon as Father Fitzgerald’s back was turned. “It is not eating him!” Robbie whispered back. “It is! You’re eating his dead body!” I taunted. He was such a lick arse, Robbie. After mass Father Fitzgerald always let him stay on in the sacristy and quizzed him about the Bible. I couldn’t wait to get out of the place, and the Father never seemed to mind. That Sunday, Robbie looked at me as I turned to skip off. “Can Eimear not stay too, Father?” he asked. Maybe he wanted the company of someone other than an old man. “I don’t think Eimear can answer all the questions you can, Robbie,” the priest chided. I never got stuck there afterwards. Robbie stopped being an altar server eventually. He didn’t tell me why. I heard Mammy talking about it in the kitchen with one of the ladies from the road. I heard his name as I was coming down the hallway, and then their voices got clearer as I got near the door. The kitchen worktop was covered in piles of paper leaflets. Mammy and the other lady were tying elastic bands around them. I picked one up. Banning divorce does not stop marital breakdown, it said. Vote Yes. Mammy took it back from me and added it to her pile. They were out on the road playing. She bundled me back out the door, too. Not long after that she said she didn’t think I should be an altar server anymore. That was the end of it. I didn’t really mind – Father Fitzgerald smelled like the carpet in school after one of the kids had wet themselves on it – no matter how much it was washed, the smell of stale wee still clung to it. Editorial comment: I’ve little to say about this piece, really. It’s well written. There are a few copy-editing issues I’d query (“an assortment”). Punctuation is a bit off in some places, and since when did a school with very small children who were liable to have “accidents” ever have a carpet? That seems to be a disaster waiting to happen :-). The unfortunate problem with the subject matter is that we’re just waiting for the revelation that Father Fitzgerald is less than saintly, so it’s not a surprise when Eimear is told she’s not going to be a server any more. But that’s not to say this piece doesn’t do what it sets out to do, which is set the scene for a closely observed child’s-eye view of growing up in suburban Ireland in the 1990s. The pace is a little languid, especially when digressing about the sisters, but you said this was a draft, so I presume you’ll be tightening everything up. I don’t get much feel for the central plot arc from the synopsis. The appeal to an agent would depend on what they thought of the subject matter and whether there was sufficient conflict in the book to draw us close to Eimear, rather than have us just watching over her shoulder as she precociously goes about her business. By means of an astute mother’s judicious intervention she seems to have neatly avoided any abuse at the hands of Father Fitzgerald, so what is Eimear’s unique challenge that she confronts and overcomes? Why should we care about this particular child growing up? It’s not ready for an agent, so as per the terms of this site I have to reject it. It does need some tweaking, I think, but this is an accomplished first draft of an as yet uncompleted novel, so I’m sure that will happen. Congratulations on a great start.